K-fulvate 10% contains potassium fulvates which are suitable for use directly as a foliar fertiliser or with other water-soluble NPK fertilisers as a chelating agent. K-fulvate chelates most plant nutrients and makes them readily available for uptake by plants through foliar applications in overhead irrigations or hydroponics systems. Scientific research has shown that the fulvic acids in K-fulvate boost the response time by plants to fertiliser applications. This is very important in correcting any nutrient deficiencies in plants during growth, especially where deficiencies in nitrogen or trace elements are concerned. The fulvic acids in K-fulvate are extracted from the humic substances of naturally derived plant organic matter. Fulvic acids are distinguished by their golden brown colour as compared to the dark brown to black colour of humic acids. 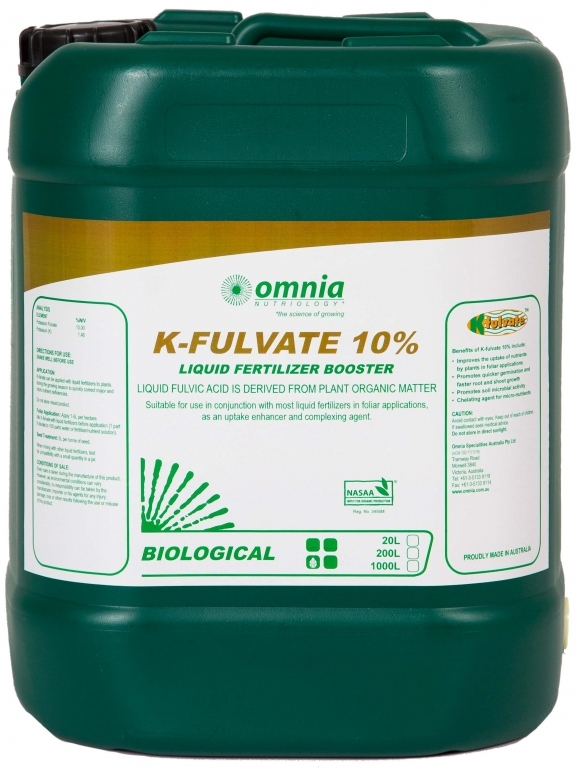 K-fulvate 10% can be applied with certain fertilizers to plants during the growing season to quickly correct major and micro-nutrient deficiency. Apply 1-5L per hectare. Mix K-fulvate with liquid fertilizers before application (1 part K-fulvate to 100 parts water or fertilizer/nutrient solution). K-Fulvate 10% is a NASAA-Certified organic product of choice.